WinAutomation is a automation tool for Windows operating system that helps users automate any repetitive task on the computer. In Mac OS X, there is a application called Automator to serve as personal robotic assistant, while in Windows there is no easily usable and customizable GUI-based (graphical user interface) actions automator app available, unless with WinAutomation installed. WinAutomation records mouse clicks and keystrokes for replaying and executing the exact steps in exact sequence later. WinAutomation also supports advanced high-level actions or steps, which users can define each step in the tasks using graphical interface. Once an automated task is created, WinAutomation will automate and execute your tasks whenever is needed. The app can greatly increase productivity, save time, eliminate errors, and automate repetitive jobs. Thanks to Softomotive for sponsoring, My Digital Life is giving away 5 licenses of WinAutomation Professional, which worth $199 each, at its latest version, WinAutomation 3.0, to My Digital Life readers, making the giveaway contest worth almost $1000. 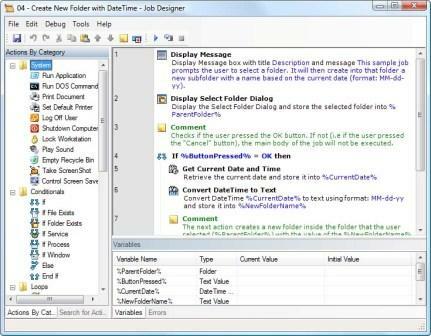 WinAutomation 3.0 Professional Edition comes with a Job Compiler which can compiles tasks as standalone executable. Note: Participants must have a Twitter account, which can sign up for free here. Follow WinAutomation tweets at http://twitter.com/winautomation (click on Follow button on the page). Copy and paste the above to “What are you doing?” box and click “Update”. Write a comment on how you plan to use WinAutomation (need it for any specific processes to automate) or how you feel WinAutomation can benefit (e.g. in terms of time, cost, more time for more valuable tasks etc). Remember to include your Twitter ID in the comment too. Contest CLOSED. Winners are Len S, ManiKanta G, John, artal73 and Katie. The giveaway contest closes on 23:59 PM on October 31st, 2009, based on server time (which is UTC+8). The winners will be selected based on five best comments on why you need WinAutomation. So wait no more, and start participating for a chance to win a license of WinAutomation.